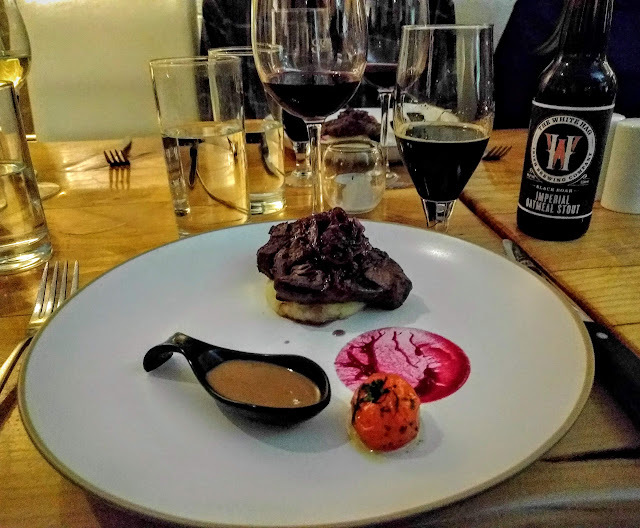 We returned to Sligo Ireland in early October at the invitation of the Sligo Food Trail to taste all that the county has to offer as an up and coming foodie destination in Ireland. We visited County Sligo for the first time in August for a long weekend filled with Yeats' poetry and stunning scenery. This time, we left Sligo with our belts a notch looser and a strong appreciation for the places to eat in Sligo. 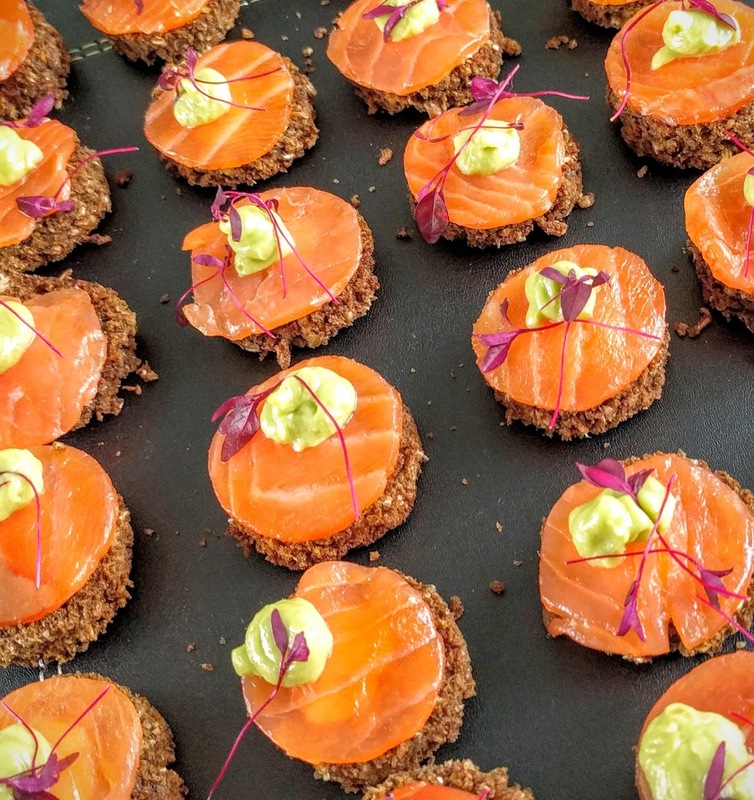 Read on for more on why Sligo is the next big food holiday destination in Ireland. Sligo is an easy 3 hour train ride from Dublin departing from the centrally located Connolly Station. In fact, Sligo is one of the best places to visit from Dublin by train in my opinion. Upon arrival at the train station in Sligo Town, you can navigate the compact city centre on foot. There is bus service to top attractions like Lissadell House and Strandhill or hire a car upon arrival to explore. Alternatively, if you already have a car, you can drive to Sligo in 3 hours or less. 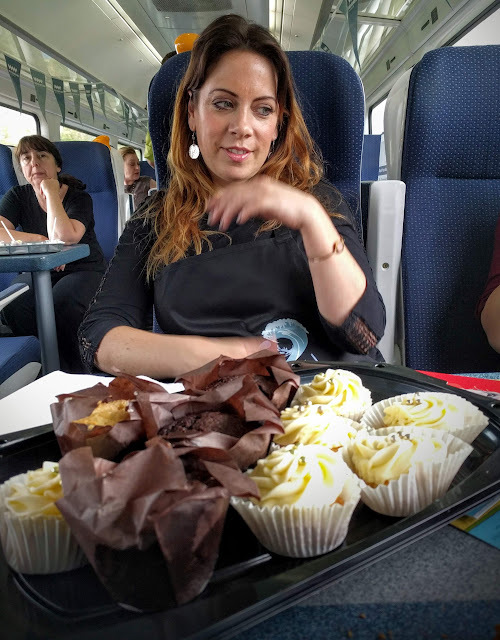 On our journey with the Sligo Food Trail, the train ride sped past as we sampled treats ranging from savory to sweet and everything in between (Chew! Chew!, I hope you'll indulge me in that pun). Our first food encounter on our Sligo Harvest Feast adventure was on the train with Marguerite and Mary from Sligo's Beltra Country Market. They filled our bellies with scones and homemade apple butter and savory Indian and Middle Eastern savories. Our favorite treat was a bowl of 'buzz balls'; chocolatey and dense, these sweet treats packed a punch and provided great fuel for the journey ahead. Marguerite and Mary were simply lovely and even composed a song for us about Sligo and serenaded us while we tucked into our eclectic and delicious breakfast. 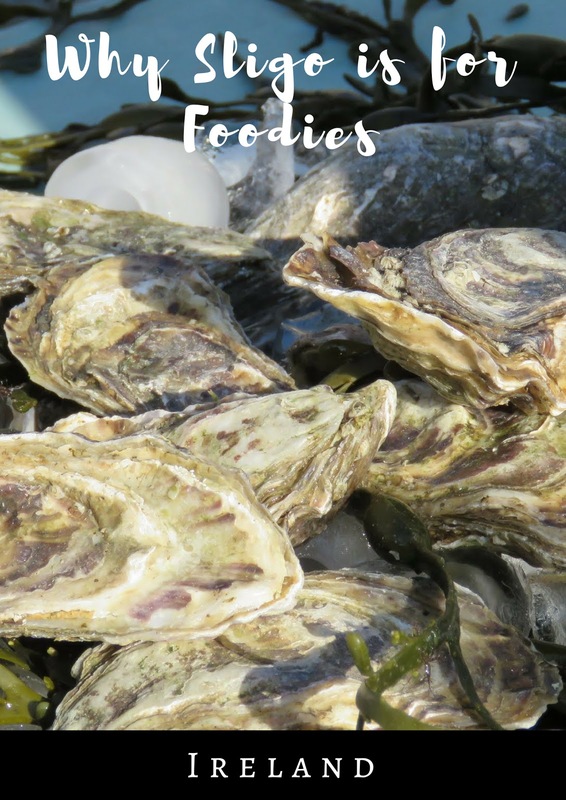 It should come as no surprise that Sligo's coastal location in the northwest of Ireland means the county has fantastic seafood. 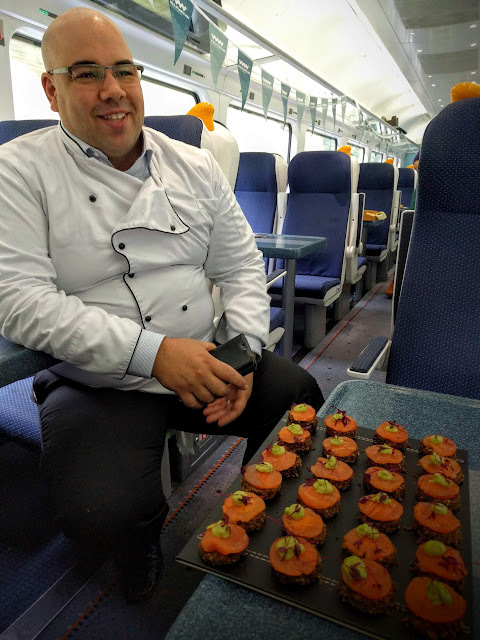 On the train, we sampled fresh salmon on brown bread with a touch of avocado aioli prepared by Chef Rodolpho Leonardo from the Conservatory Restaurant at the Riverside Hotel in Sligo Town. I found that I just couldn't stop myself from eating more than one delicious bite. We also met Eithna O'Sullivan from Eithna's by the Sea on the harbour of Sligo's Mullaghmore peninsula. Eithna's by the Sea is a family-run restaurant and Eithna told us proudly about how her son and daughter grew up in the restaurant and learned both the business and outstanding culinary skills from her. Given the location, Eithna's is best known for lobster. Eithna also works in partnership with Prannie Rhatigan to incorporate healthy seaweeds into her cuisine. We sampled some delicious and flaky cheesy crackers flavored with seaweed. 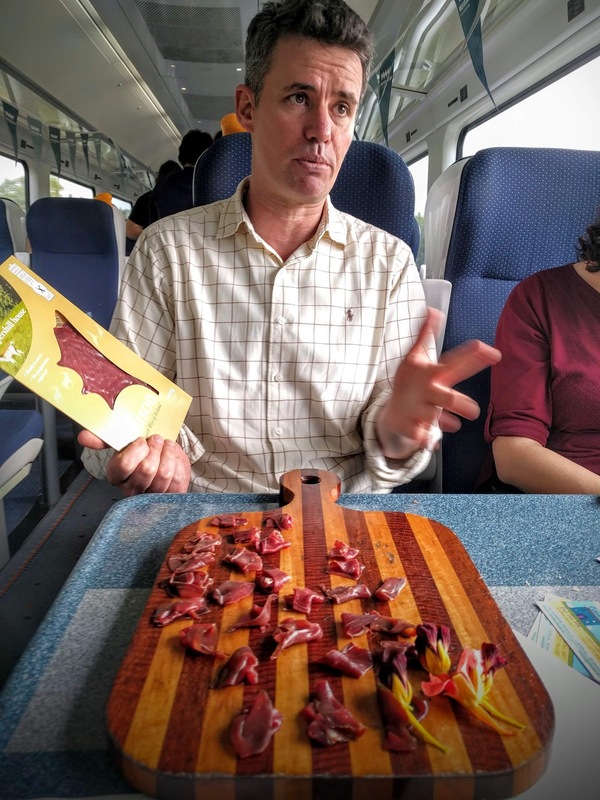 As we continued to speed from Dublin toward Sligo on the train, we were introduced to Simon O'Hara from Coopershill Farm. 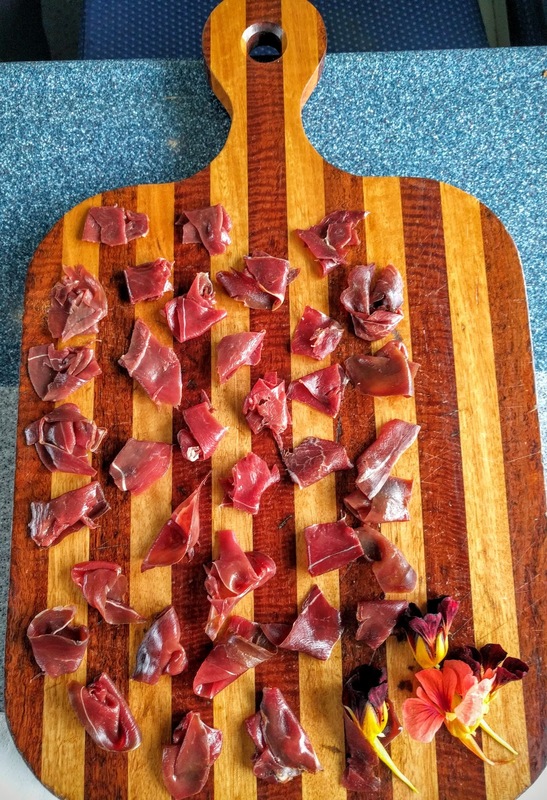 We tasted some artisanal smoked venison made from animals raised at Coopershill Farm, another family run business. When the train pulled into Sligo's Ballymote station, we got a special delivery from Adrian Sheerin from Sheerins Meatin' Place. Three types of sausage prepared by hand were laid out: pork, black pudding and thyme; pork and cracked pepper; and the award-winning Maud Gonne (named for WB Yeats' unrequited love) which was filled with pork, garlic, sage, salt, pepper, and red wine. Delicious! At the opposite end of the spectrum, we quickly discovered that Sligo can sate a sweet tooth as raging as my own. Aisling Kelly from WB's Coffee House in Sligo Town talked about how she built the business from scratch as we munched on chocolate muffins and prettily decorated cupcakes. Rolls with a subtle sweetness from My Strandhill Bakery were another welcome treat on our train ride. We even got to sample hand decorated chocolates from The Glasshouse in Sligo Town. I'll admit, we were getting pretty full at this point and our Sligo Harvest Feast was just kicking off. 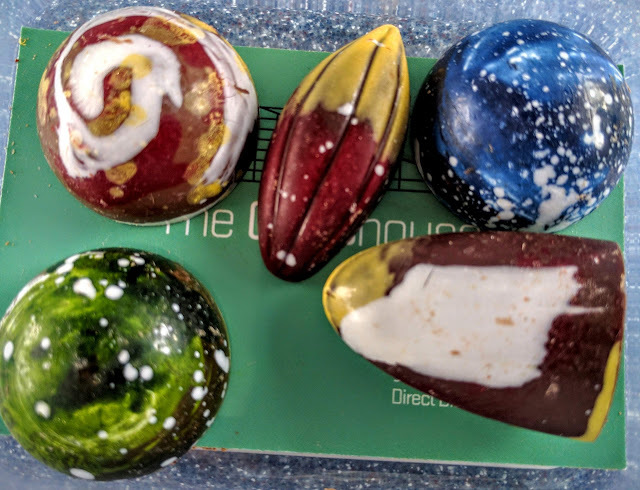 I ended up saving a number of the chocolates to take home and have been thinking about Sligo as I eat them one by one (rationing myself to one per day!) with a cup of coffee or a glass of red wine. I can tell you from experience that Glasshouse chocolates pair well with both beverages. We also met Teresa Krebs from Cawley's of Tubbercurry on the train. Cawley's has been in business for more than 50 years and offers boutique accommodation not far from the Knock pilgrimage site. In addition to giving tourists and pilgrims a place to lay their weary heads, Teresa also serves fantastic food. 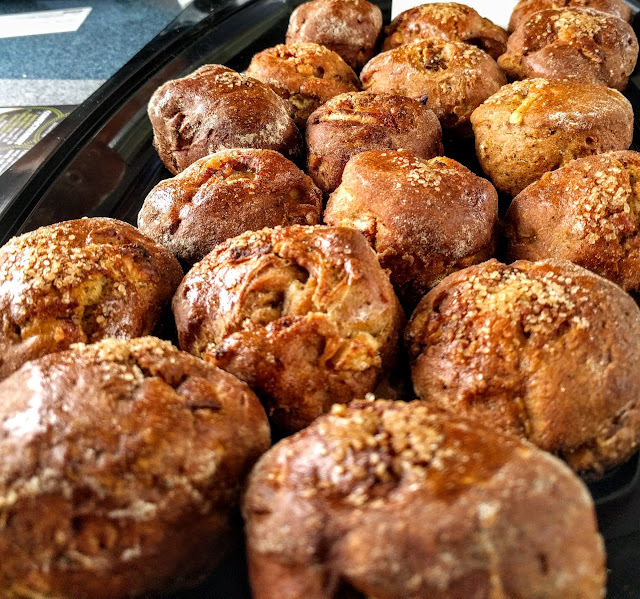 We sampled her rum balls (another treat that I got to take home and have been rationing to extend the delicious experience). Cawley's rum balls are sweet but not too dense and not too boozy. They are just right for an after dinner treat. We also took home a loaf of Cawley's Guinness bread. Much like on our other adventures, food memories last the longest for us and that's especially true when we bring home something special from the places we visit. It turns out that Cawley's bread is delicious with traditional butter or jam. I also found that it works with turkey and hot sauce for a savory sweet contrast. Great stuff! The day before we were set to depart from Dublin for our Sligo Harvest Feast, Eala Bhán restaurant in Sligo Town won four honours in the Yes Chef awards: Best Newcomer Regional, and Best Newcomer in Ireland plus Eala Bhán chef Marcin Szczodrowski was named Best Chef Regional Winner and Rising Star Winner. 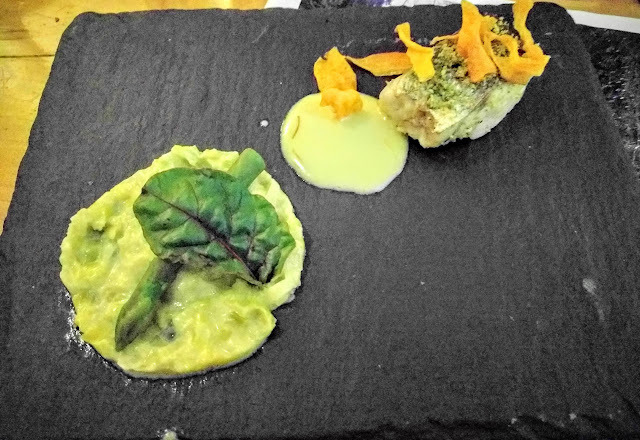 We had the privilege of eating not one, but TWO, multi-course meals prepared by Eala Bhán during our stay in Sligo. Lunch at Lissadell House included a Taste of the Wild Atlantic Way (see above) served on a rock hand selected from the beaches of Sligo. We also tasted herb crusted Tubbercurry Sligo lamb with red wine and rosemary reduction, mint courgette puree, and seaweed mash. Our lunch was punctuated with an assiette of desserts. The favorite was universally the peanut butter cake with crushed chocolate topping. Outstanding! I can see why Eala Bhán has received notice and acclaim from the culinary community in Ireland. Dessert was a mini baked Alaska with a chocolate sphere decomposed table-side to reveal the surprise inside. The chocolate part of the dessert was like a deconstructed chocolate fondue. Yum! Our entire group raved about the meal. 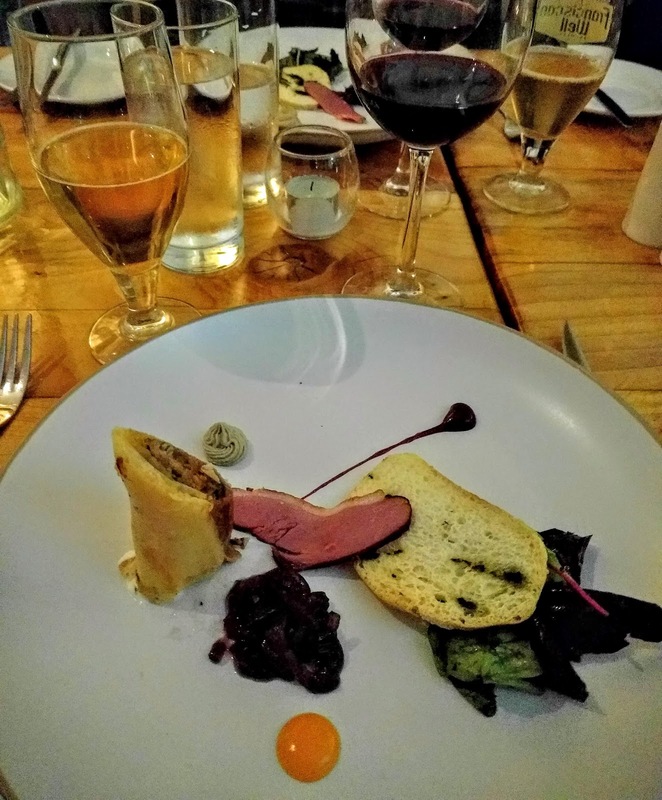 The meals we had in Sligo were some of the best I've tasted in six years in Ireland. Our Sligo Harvest Feast also included a lesson from renowned seaweed expert Dr. Prannie Rhatigan. 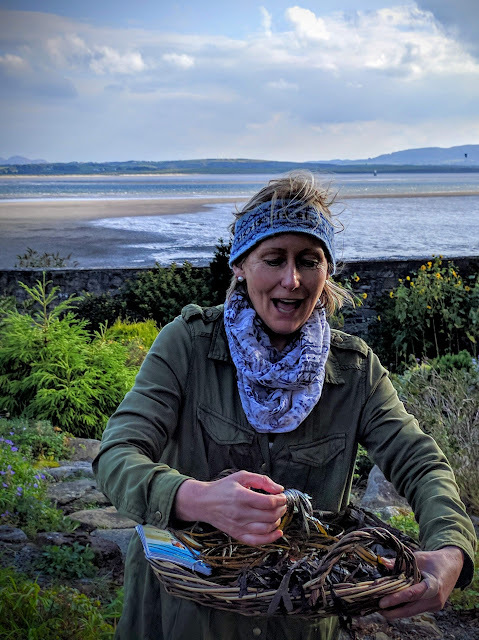 Sitting in the Alpine Garden at Lissadell House with sweeping views of the sea, Prannie showed us the different types of seaweeds that can be harvested in Sligo. We even got to sample some seaweed fresh from the beach with only the sand rinsed away. Prannie is a medical doctor and proponent of the health benefits of seaweed. Walking down to the beach, Prannie showed us different types of seaweed in their native habitat. Just don't try this at home folks. You need a license to harvest seaweed in Ireland. Interested in learning more about how to make seaweed a part of a healthy diet? Prannie's book Irish Seaweed Kitchen will show you how. Back at Lissadell House, we learned first hand that Sligo has the freshest oysters around. Glenn Hunter from Wild Atlantic Oyster was shucking oysters on the spot for our enjoyment. With a splash of lemon, the Sligo oysters were a refreshing treat after our bracing seaweed foraging expedition. Somewhat surprisingly, we also found that Sligo has an Italian soul. Lucia Cecchini who runs Laura's of Carney is from Bologna in the Emilia-Romagna region of Italy (a foodie paradise as I've described before on Sidewalk Safari). Lucia served up a delicious aperitivo spread for our group. My favorite treat was a light pastry pillow filled with Parmigiano-Reggiano cheese and a drizzle of honey on top for a perfect combination of savory and sweet. We also discovered Mammy Johnston's which is run by an Irishman trained in the art of Gelato making in Bologna, Italy. Ice cream makers Michael O'Dowd and Neil Byrne have even won an award as the world's best at their craft. Located in Strandhill, Mammy Johnston's is a charming spot for gelato in imaginative flavors. The coconut and chocolate was my favorite. Despite eating a lot up to that point during our Sligo Harvest Feast, there's always room for ice cream! Sligo also boasts a thriving craft beer scene. White Hag Brewery in Ballymote provided beer pairings with each dish of our six course tasting menu at Eala Bhán, From session IPAs to Imperial Oatmeal Stouts that pack a punch in flavor and strength, White Hag Bewery is yet another reason that Sligo is an up and coming foodie destination in Ireland. We finished our dinner at Eala Bhán at around midnight. We were preparing to head back to our accommodation at the Riverside Hotel in Sligo Town to slip into a full blown food coma when Anthony Gray, President of the Restaurant Association of Ireland (RAI) and Chairman of the Sligo Food Trail suggested going out for a sneaky pint at the historic Thomas Connolly Pub. We somehow got a second wind so we could enjoy the craic. Even late on a Wednesday, the pub was hopping. A duo was playing folk songs at the front and taking requests from the audience. 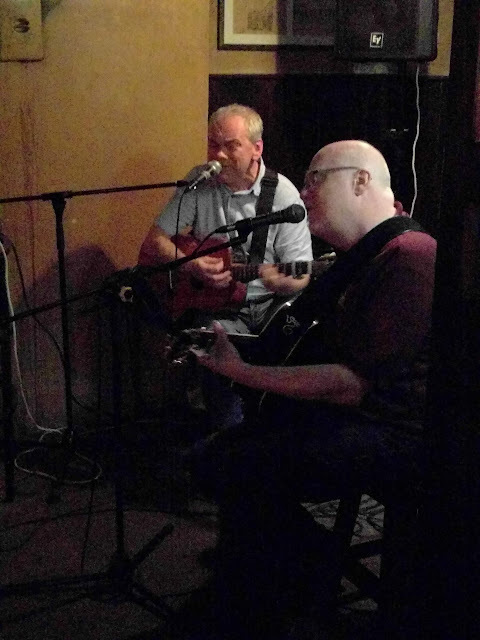 Anthony even had a go and regaled us with a rousing rendition of a pseudo-French folk song. We finally called it a night at about 1:30 am. Sligo definitely knows how to have the craic. 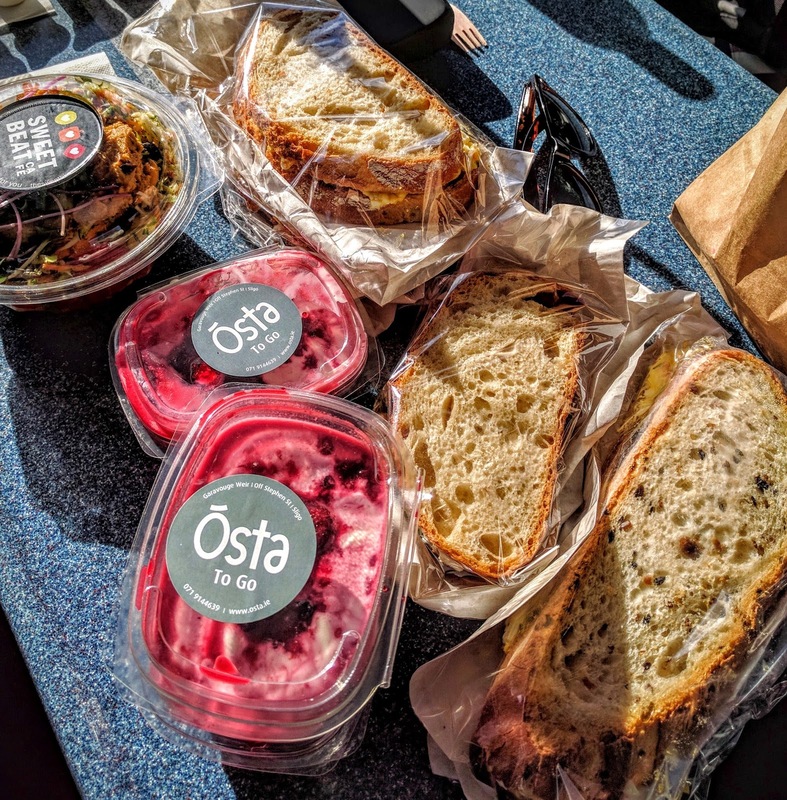 If you are looking for a meal on the go, Sligo also has you covered. Cafes like Sweet Beat, Knox, and Osta Cafe are perfect for packing a picnic lunch to explore some of the brilliant coastal scenery that Sligo has to offer. While this post focuses on food and the culinary experiences you can get in County Sligo, it's important to point out that Sligo has so much more to offer, especially history. Lissadell House was the ancestral home of Irish Freedom fighter Constance Markievicz. A small museum on the property features some of Countess Markievicz' personal effects and artifacts of the 1916 rising. When we had lunch in Lissadell House, some members of our group (myself included) dined on the very table that WB Yeats once used to write some of his poetry. I couldn't resist lifting up the table cloth to have a look at the surface. 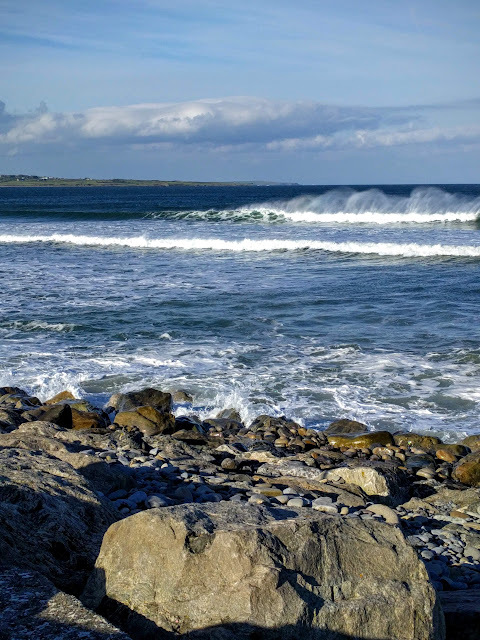 Sligo certainly shines when the sun is out and we enjoyed some of the most stunning scenery I've seen in Ireland with the added benefit that we weren't jockeying for a place to enjoy the views with bus loads of tourists. Sligo (for now) is very much off the mainstream tourist radar. Get there soon for an authentic experience. Autumn views over the Garavogue River in Sligo Town greeted us when we opened the drapes in our room at the Riverside Hotel. Iconic Benbulben rises above the landscape and is particularly striking when moving clouds cast their shadow across the face of the mountain. Sligo is perched right along the Wild Atlantic Way and thus offers stunning coastal scenery. As my regular readers know, walking is one of my favorite pastimes and is the best way to really get to know a new place. In Sligo, Strandhill is an excellent starting point for a walk among the dunes and local historic sites. Our group had the pleasure of meeting Auriel Robinson and her dog Zara from Seatrails, a local company that offers guided coastal walks. We soon learned why the Wild Atlantic Way is named thus. We took a guided walk with Auriel to the Killaspugbrone Church. Interestingly, the trail crosses the edge of the runway at Sligo Airport! Fortunately, Sligo Airport no longer receives scheduled commercial flights so our walk wasn't interrupted by air traffic. We trekked out to Killaspugbrone Church (about a 30 minute walk from Strandhill) and learned about its significance. St. Patrick himself passed through here in the 5th century. Today, Killaspugbrone offers sweeps views of both Benbulben and Knocknarea. This would definitely be an idyllic spot (although a bit windy) for a gourmet Sligo picnic lunch. All throughout our trip, we were struck by the amazing people we met from Sligo and how they really came together with tremendous pride to show off their home in the west of Ireland. 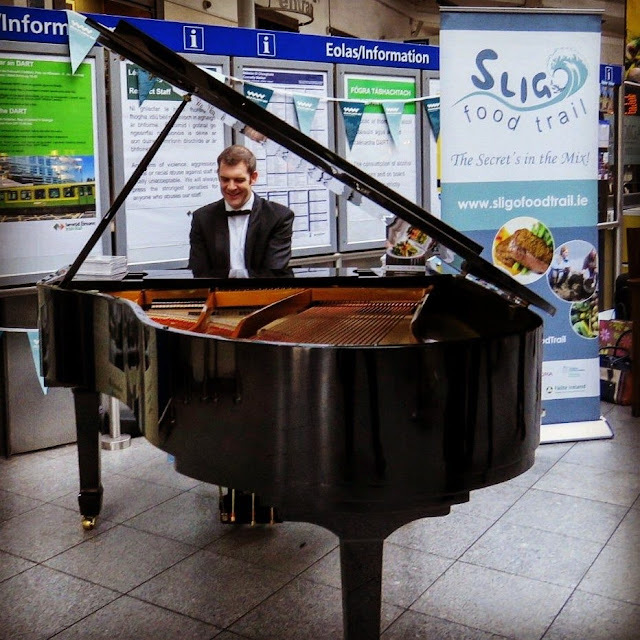 From Kieran Quinn shlepping a grand piano through Connolly station to regale commuters with fine music to the Sandbars, the awesome quartet that serenaded us on arrival in Sligo Town, we were really impressed. This trip really was a group effort and you could just feel the craic all throughout the experience. We were truly grateful to be a part of it. 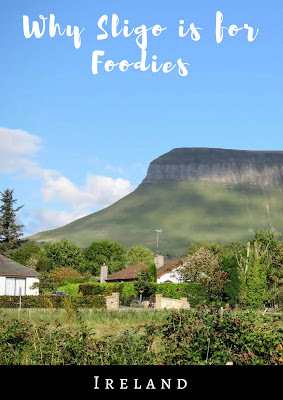 Disclaimer: A group of bloggers and press were invited to visit Sligo thanks to the generosity of The Sligo Food Trail, Sligo Tourism, Fáilte Ireland, The Wild Atlantic Way, and Irish Rail and I was excited to be a part of this grand adventure. Please note that the views expressed in this post are my own. My previous visit to Sligo described in An Irish Roadtrip Weekend In and Around County Sligo Experienced Through the Life and Poetry of W.B. Yeats was not part of a press trip and was entirely self-funded. Explore the Sligo Food Trail and find out why Sligo is for foodies. 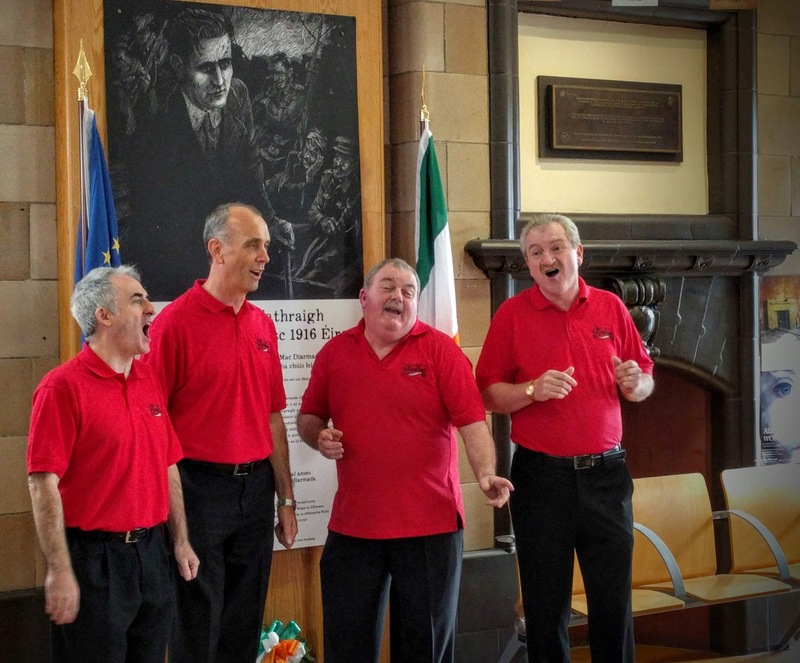 Learn about things to do in County Sligo. 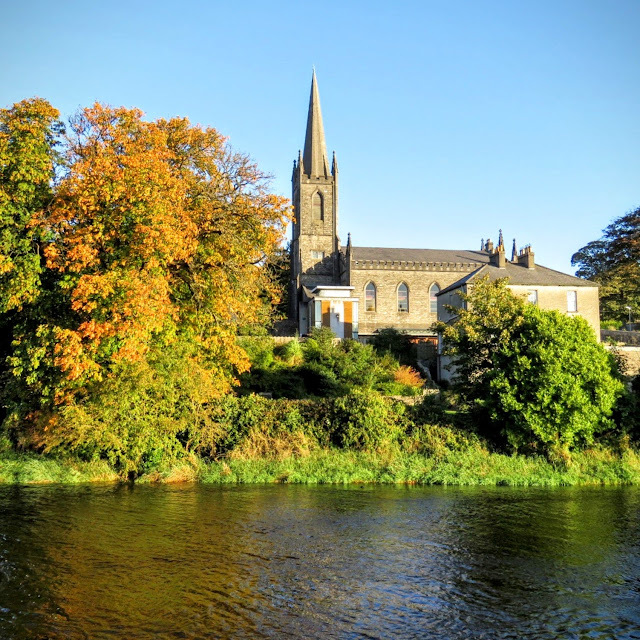 Read about places to eat in Sligo town. Take trip from Dublin to Sligo and sample Sligo food.